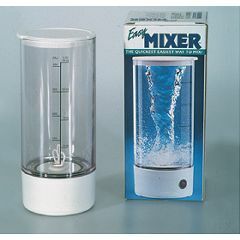 The Easy Mixer Drink Blender mixes and blends your smoothies, up to 16 oz., faster and easier than any other method. Just add ingredients, blend, and pour or drink right from the container. Small enough to carry. Lightweight, compact size, quiet motor, supersealing lid and build-in measuring cup make it perfect for travel, home, office, school, or restaurant! Great for blending light drinks to pudding consistency. One-touch on/off switch allows accurate mixing. Durable acrylic is cold- and heat-resistent. Dishwasher safe. Requires two AA batteries, sold seperately. Instructions and sample recipes included.